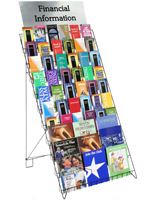 This literature rack features 45 pockets for displaying multiple publications. 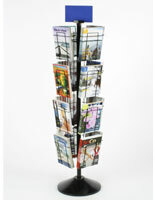 The literature rack, also called a leaflet holder or brochure rack, features wire pockets with a divider hook. 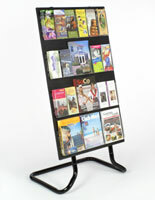 With the hook in place, the literature rack can hold 45 different tri-fold brochures. 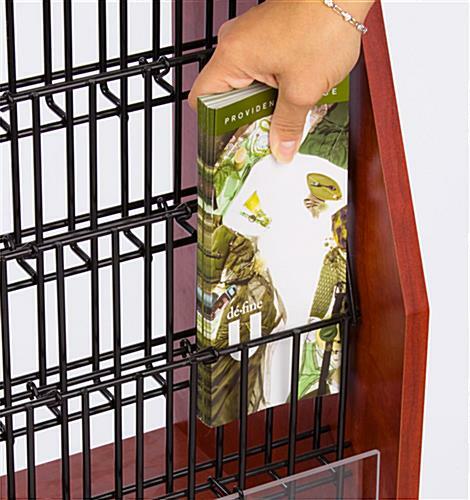 The hook also detaches to allow you to display 8-1/2" x 11" literature as well! 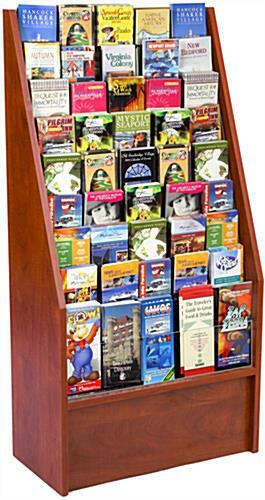 As a result, this literature rack is an ideal leaflet holder for travel agencies, hotel lobbies and other tourist information centers. 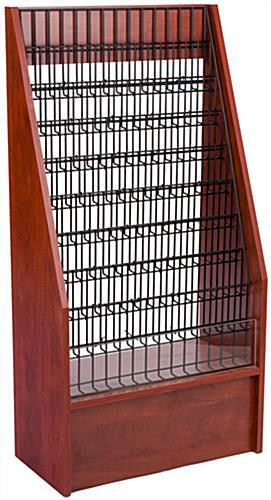 This brochure rack, literature rack features a red mahogany finish to coordinate with most environments. 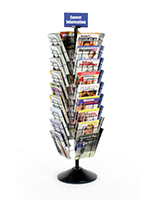 Its upscale appearance, paired with its economical price, makes the literature holder ideal for use in any business. 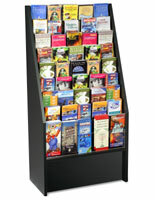 We also sell the literature rack in a black finish as well (see related products to the right). 24.0" x 47.0" x 11.5"
Great Product..just what we were looking for! Great product! Easy to assemble, and nice quality. 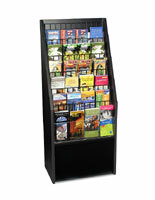 The display area for brochures is very adaptable to different width brochures and information. We ordered two and might order a 3rd because they are so nice and we need more room! Highly recommend. Sue, thank you so much for taking the time to share your photo and write this excellent review! 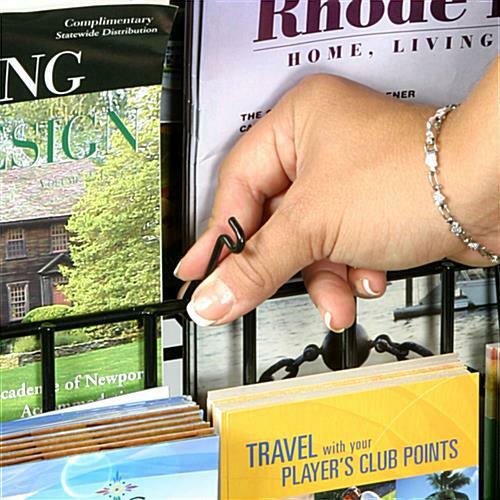 We're happy to hear that this adjustable literature stand was easy-to-assemble and perfect for displaying brochures of different sizes. 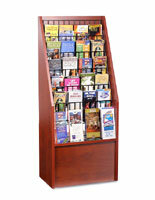 The stand looks great in your photo, and even matches the picture frames above! Thank you again for recommending our product. We hope you'll shop with us again soon! This product was a little tricky to build because you had to insert the screws a certain way and I'd never see those types of screws before. In addition, the drilled holes for the screws didn't always fit the screws the way they should. Once the product was completely built, it had a nice, sturdy look about it, but I think the wire dividers are a little irritating. 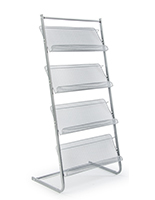 They don't stay in place very well; however, for the price, this is a very useful rack. Thank you so much for taking the time to send us this thorough feedback, Deanna! We will pass this along to our product developers to review. This was purchased to be used by the reception desk in our church to display pamphlets and it is a very attractive unit. No issues with setup and we have received a number of compliments on the look and practical application. When I first saw the packages that arrived, I thought I had a disaster on my hands. But to my surprise nothing was missing or broken. Only the wire mesh was bent. I assembled it and put it to use. The rack was much smaller than it appeared and it should have wheels for easier placement. Thank you for letting us know about the state your packaged arrived in and for sharing your thoughts for product improvement. We use customer input like this to better our products and customers' experiences with us in the future, so we appreciate the time you took to write to us. We hope we get to work with you again in the future! Once assembled the rack is very nice looking. My only suggestions would be for an instruction sheet. It was fairly straight-forward to assemble, but I know there are some who would need the instructions. 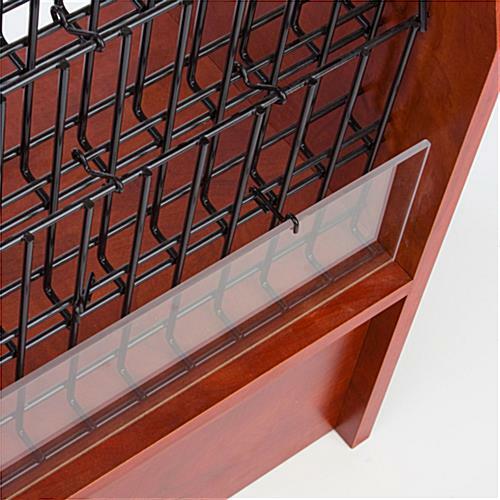 The plexi-glass on the front, was very tight and could possibly be thinned by 1/32" or 1/64". It would be nice if there was a sign holder that attached to the top and allowed a person to slide in a paper/cardstock sign (preferably the width of the rack and allowing a 6" tall sign. Hello Rudy, thanks for your positive review. We have forwarded your suggestions to our engineering dept. !